Villa Madama is a prominent house that was built in Rome in the sixteenth century and decorated with Renaissance masterpieces inspired by Raphael's works of art. Since 1937, when it was leased to the Italian Ministry of Foreign Affairs, and 1941 when it was purchased by the Senate, it has been the place where important agreements were sealed – such as the one in 1984 between the Italian Republic and the Vatican. It is in the same Villa Madame that Italy recently signed 29 accords with China. These accords will perhaps symbolically contribute to a modern renaissance of Italy's national economy. Italy is not the first European country to officially join the Belt and Road Initiative (BRI). Others such as Greece, Portugal and members of the 16+1 scheme had already agreed to jointly advance the construction of the BRI with China. But what is significant is that Italy is the first country in the G7 family to sign a relevant memorandum of understanding with China. Rome's decision shows the importance a leading European economy accords to the Belt and Road Initiative, its ambition for win-win results and its determination to defy Brussels' neo-Cold War mania. In one of his March speeches, Italian Deputy Prime Minister Luigi Di Maio, who had already visited China twice, allayed the concerns by political camps which criticized Italy's participation in the BRI. He did this by placing the "Sino-Italian honeymoon" in Italy's interest and argued that it can serve to boost the country's made-in-Italy agenda. This is indeed what can happen in the medium and long-term. The Italian coalition government, composed of a left-wing party, the Five Stars Movement, and a right-wing one, the League, came to power last year by promising better times to Italian citizens after years of austerity, and painful but necessary reforms. Ensuring the continuous rise of exports is among Italy's priorities to reinforce its economy. The general volume of exports shows a gradual increase in the last few years. According to data from the Italian Economic Development Ministry, this volume increased from €412.2 billion in 2015 to €417.2 billion in 2016, €449.1 billion in 2017 and €462.8 billion in 2018. China was the 10th most important export market for Italy last year and further room for improvement is evident. A similar upward trend is observed since 2015 with a slight exception in 2018. 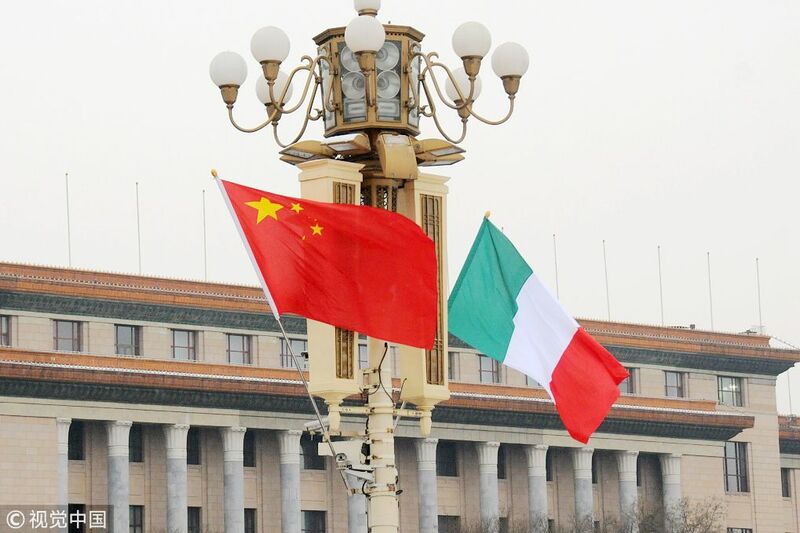 In 2015, Italian goods worth €10.4 billion were exported to China compared with €11 billion in 2016, €13.4 billion in 2017 and €13.1 billion in 2018. However, Italy still lags behind other EU countries in its export volume to China. Eurostat data shows that Germany has the lead, exporting goods worth €93.7 billion in 2018, followed by the U.K. (€23.3 billion) and France (€20.8 billion). Italy's ranked fourth in the EU. It is therefore understandable for the Italian government to set new objectives and consider the U.K.'s and France's export numbers as targets to aspire to. Among the recent Sino-Italian accords signed in Villa Madama, some stipulate for closer bilateral cooperation on the potential export of Italian meat – frozen pork and bovine ovum – as well as fresh Italian agricultural products and wine to China. Beyond exports, the win-win collaboration between China and Italy can also be realized in infrastructure works. The development of ports is another area worth looking into as some Chinese companies are already present in this sector. In 2016, for example, COSCO purchased a 40 percent stake in APM Terminal Vado Holdings, which operates a terminal at Vado Port. In 2017, a consortium made up of the China Communications Construction Company, Ltd. (CCCC) and two Italian companies, 3Ti Progetti Italia and E-Ambiente, signed a contract on the design of Phase 1 of the Venice offshore port. Following the signing of the memorandum of understanding between Beijing and Rome, Chinese interest in investing is expected to grow. The strategic geographical position of Italy makes it a critical passage for the realization of the Belt and Road Initiative. The ports of Palermo, Ravenna, Trieste and Venice will possibly offer new connections between the maritime and land routes, should the appropriate investments take place. But it is not all about business. The will to forge partnerships on culture, science and research was not absent in Villa Madama. Better knowledge exchange between the two countries will also contribute to better understanding between both parties. China needs to learn more about the world, and the outside world needs to learn more about China. Italy has embraced this vision and even its previous government had looked favorably upon Beijing. Italy's former Prime Minister Paolo Gentiloni, for instance, attended the first Belt and Road Forum for International Cooperation in May 2017. Certainly, the new MoU on the BRI is advancing the Sino-Italian bilateral partnership and pushing it to new heights. Italy's signing of BRI agreement with China shows its belief in the historic project and its determination to defy Brussels' neo-Cold War mania.